Understand the risk factors for your loved one’s condition. Can Home Health Help Your Loved One? If you’re an adult caring for your mom, dad or other family member with health care challenges, you’re not alone. If you’re an adult caring for your mom, dad or other family member with health care challenges, you’re not alone. More than a third of Americans find themselves in the same position. It can be overwhelming for the entire family – especially if you don’t know where to turn for answers and support. 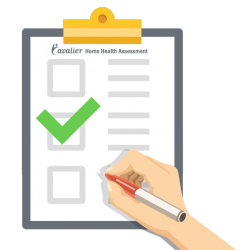 This questionnaire will help you understand the risk factors for your loved one’s condition and if home health care can help. You’ll also receive a personalized report you can print or email so you can reference it later. Has your mom, dad or loved one been diagnosed with any of these conditions? Have they experienced any of the following in the past 3 months? Have they been diagnosed with a terminal condition and a life expectancy of six months or less? Has their doctor prescribed any of the following medications or treatments? Does your loved one have trouble keeping track of which medications they’re supposed to take, or have they accidentally taken the wrong medication or dose? Do they have difficulty performing any of the following activities? How often do they visit or call the doctor to deal with symptoms of their condition or side-effects from medication? How difficult is it for your loved one to move around and leave the house? Please select the option that best describes their current situation? Their condition makes it very difficult or impossible to even leave bed. Leaving home requires a taxing effort that exhausts them. They leave home infrequently and briefly because of the difficulty. They use a walker, wheelchair, or require another person’s help to leave home. They have some difficulty leaving home, but not enough to stop them from going somewhere. They have no difficulty leaving home. What are your health care needs? Please select one of the health areas below to learn more details about that specific condition and how Cavalier can help. 2017 Copyright Cavalier Healthcare Services, Inc.